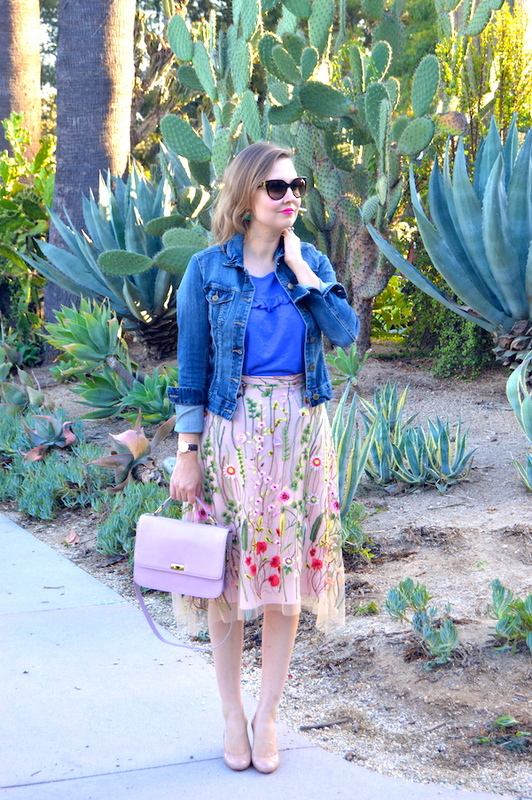 When I first laid eyes on this Waverly Garden skirt from Anthropologie, it was love at first sight! What's not to love? 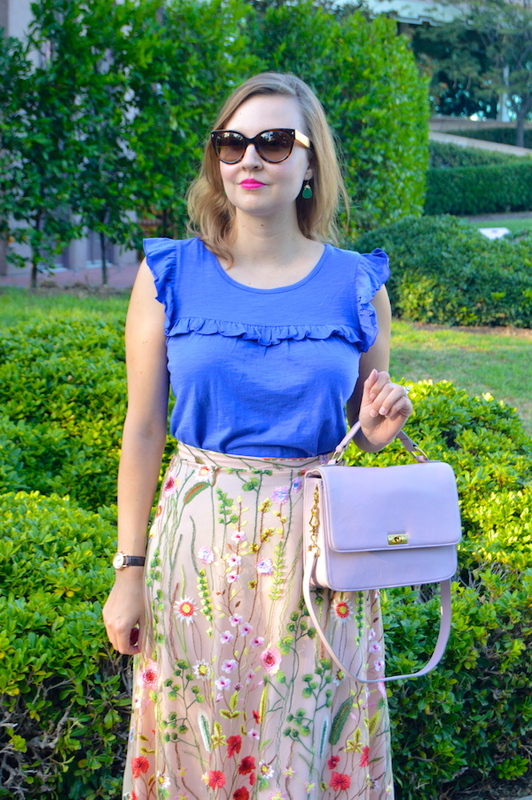 It's essentially a classic, romantic style skirt with bright, colorful embroidered flowers. This means that both the part of me that loves classic styles and also the part of me that loves bright colors will be satisfied! The other thing that attracted me to this skirt is that it's from Eva Franco. I have a few skirts and dresses from this designer and I love them all! The designs are outstanding and they are made here in the United States, which is something I like to support if I can. Plus, I use it as a selling point with my husband when I spend too much on clothing. For example, my husband might say, "You spent how much for that skirt?!" to which I will reply, "well, it was $200, but it is made here." 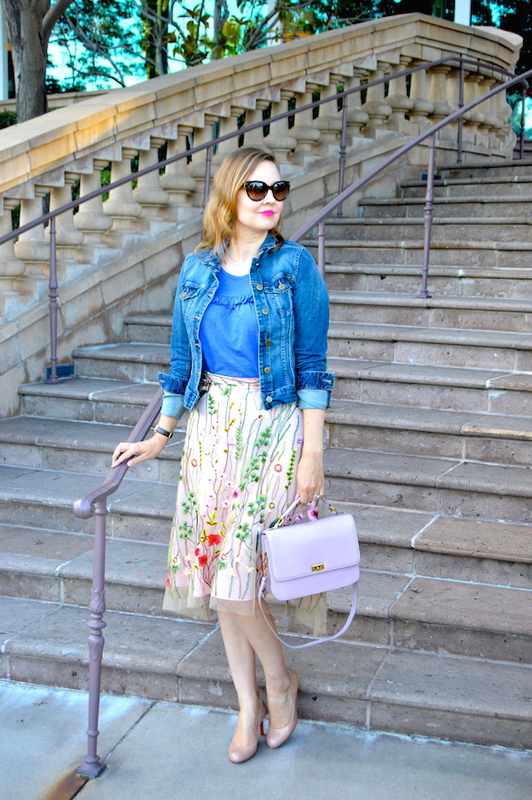 Actually I usually round down on prices too, so, for example, this skirt was actually about $170, so naturally I will round it down to $100 when I tell my husband! 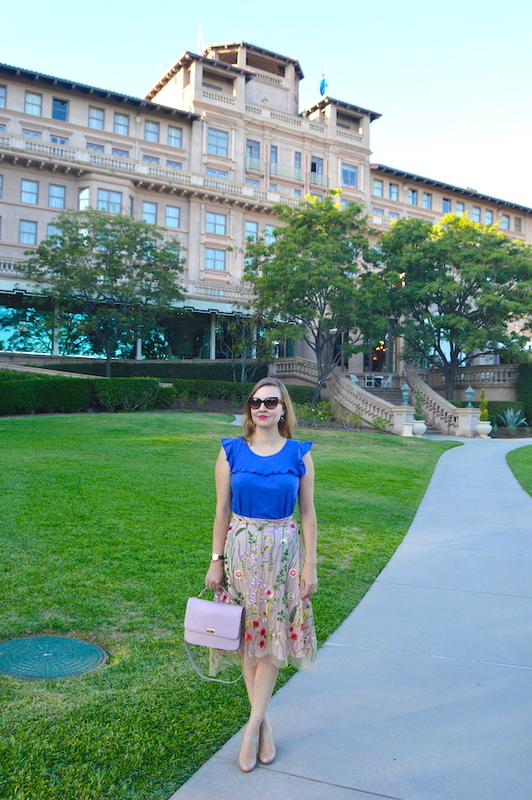 In the photo below, you will see the location of this particular photo shoot, which just happens to be at the Huntington Hotel, now the Langham Hotel in Pasadena. My husband and I went to a bourbon dinner here at the Royce Restaurant. Basically, I will just magically show up anywhere that bourbon is being served, especially if it's being served alongside excellent food, which was the case with this event. Overall, it turned out to be a wonderful evening with delicious food, great bourbon cocktails, and neat bourbon tastings, and since this is the location where my husband and I were married years ago, it was also quite romantic! It is such a gorgeous skirt! I love how you styled it. Oh my goodness that skirt is just beautiful! Love it with the jean jacket!